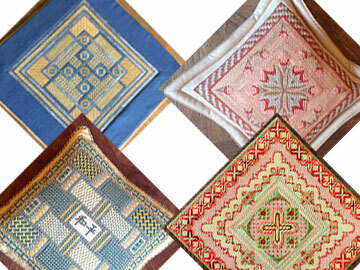 Needlepoint is a form of embroidery, made stronger by being stitched on canvas. 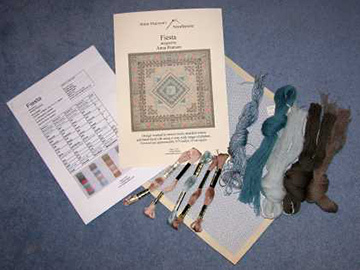 Well known embroidery stitches are supplemented by an array of new techniques and beautiful yarns. The degree of difficulty is up to you. You do not need experience or complex equipment to enjoy needlepoint. Smaller or simpler pieces are perfect to work on while travelling or on vacation. Needlepoint is often incorrectly referred to as tapestry. You can call it “canvaswork”, but genuine tapestry is woven on a loom over a background of vertical threads. The earliest examples of needlepoint date from the 16th century, often produced as decorative strips, or “slips”, which were then stitched onto curtains or samplers. In later years, as houses grew more comfortable and better furnished, needlepoint developed into an interior artform in its own right, used on cushions, chair and stool covers, rugs and firescreens. Needlepoint designs can be pictorial, and we can supply painted canvasses to order, but our popular Anna Pearson designs are “counted thread” work on canvas. The high quality yarns included in our kits are varied and include crewel wools, stranded cotton, pearl cotton, hand-dyed silks, ribbons, and metallic threads. The stitches used to give texture to our designs include the familiar Florentine, or “Bargello” stitch, cross-stitch, tent-stitch, and many others, all combined in new and attractive ways. Our kits are supplied with 14 or 18 mesh canvas in either white or brown depending on the colours chosen for the yarn. Each design is available in several suggested colourways. However, as we have found that many stitchers like to co-ordinate the work they have on display in their homes, we can of course supply to a specified colour palette if so requested.